Many football fans will know of Memphis Depay. He’s undoubtedly a great talent, but in the past he hasn’t really shown what he’s capable of. Depay completely annihilated the Eredivisie, scoring 40 goals in 90 appearances. This interested Man Utd, who signed him… but he only managed 2 goals in 33 appearances before being moved to the Ligue 1, his new home being Lyon. He has again shown what he is capable of, with 21 goals in his first season for Lyon. With the rumours intensifying that Nabil Fekir will be leaving Lyon, this gives Depay an excellent chance to show exactly what he can do. What makes Memphis Depay a good purchase? Nabil Fekir rose on the Index due to his Performance Buzz capabilities. He currently sits at around the £4 mark, however, this is around £1.70 more expensive per share than Depay. The fact is however, Memphis Depay has earnt more in Performance Buzz dividends than Fekir has! The annoying thing (as a holder of both of these players) is that they play in the same team, thus competing with each other as they’re both Forwards. If Fekir manages to achieve a transfer away from Lyon, I can only see Depay’s price increasing due to the fact that he will have less competition at Lyon. However, this will be decided when we see who the replacement for Fekir would be. However, Fekir has a little more attraction this season, he has the World Cup and a potential summer transfer ahead of him. Manchester United have not been successful for the last few years now, there has been many manager changes, with these changes come philosophy changes. Van Gaal was brought into Man Utd for the ‘regeneration project’, to make United great again. He insisted on buying youngsters, to build a solid core of players for years to come. Luke Shaw, who was playing fantastic until his double leg break against PSV. Memphis Depay, who was showing every sign of being a world-beater. Anthony Martial, who set the Premier League on fire! Not a purchase, but he introduced Rashford to the First team, with amazing results. Things were looking great for Man Utd again, although tactically the fans thought the style of play was boring and he didn’t survive long. Next up is Mourinho, who wanted some quick fixes with the Man Utd squad. Memphis Depay was sold, although Mourinho claimed he has the potential to be world class. The problem? Mourinho has Martial, Rashford (& soon to be Alexis Sanchez) all wanting to play on the Left Wing also. Man Utd agreed to sell Depay, but they included a buy back price of £25m. Does Mourinho see a future with Depay? Or are they worried it could be another mistake like with Paul Pogba? As I briefly mentioned above, Memphis Depay has earnt £0.72 in dividends this season alone. This is all from Performance Buzz. Memphis is actually the 4th highest performer on Football Index, only Ronaldo, Messi & James Rodriguez sit above him. It’s hard to tell really how great this is, but bare in mind Ronaldo & Messi are both around £9, James Rod is almost £4… Neymar is £13 and behind him in 4th place! Memphis also started the season at around £1.20, so it’s not too far away from 100% R.O.I from dividends alone. Memphis Depay is NOT going to the World Cup. This will bring around some caution with his price, as traders will look more towards the short term on Football Index. In their minds, if he’s not at the World Cup, he has no value at present. Football Index has lots of new customers which potentially have started to trade instead of bet with bookmakers. Ex-Gamblers will probably have less patience, I am an ex-gambler and I know I used to have very little! They would rather gamble their chances on earning some dividends during the World Cup & then re-sign Depay afterwards! What I am trying to say is, for any player that isn’t going to the World Cup, do not be surprised to see their price dip a little, or a lot! I decided to award Depay with this ‘award’ as he has managed to prove that has the ability to perform at high levels. His dividend wins weren’t on single match days, he has managed to win on multiple Treble Match Days! 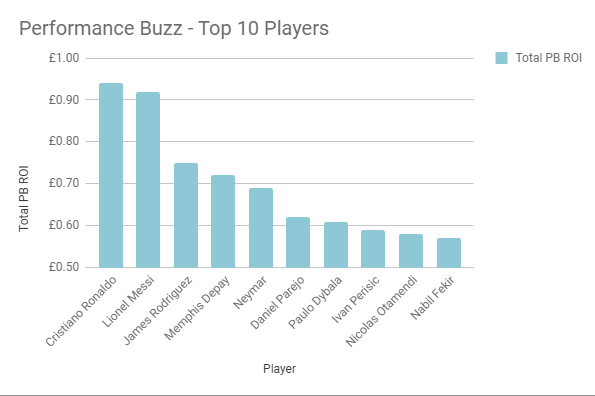 In terms of price, he is a boy against the men, but he’s the 4th highest earner for Performance Buzz. Man Utd are quite busy on the left wing, but there is a small chance that Depay could return under the Buy Back Clause. If Fekir leaves, this will only improve Depay’s price, however, expect it to dip leading up to the World Cup and during it, as Netherlands aren’t featuring. PreviousPrevious post:Mohamed Salah – Football Index Player of the YearNextNext post:Should you purchase Trackers?